The Madrid-Barajas Airport was designed by Luis Gutiérrez Soto, an architect, and Marqués de los Álamos, a civil engineer, on an empty 330 hectare plot of land close to the town of Barajas near Madrid in 1928. It was officially opened on 22nd April, 1931. In 2007, more than 52 million passengers passed through the airport. Since that time it has become one of the most important aviation centres in Europe. It is the primary Central and South American flight link to and from Europe, and it is the world's largest airport measured in terms of the area covered by the terminal buildings; over 11 million square feet in fact. Many people will be flying into Madrid simply for a quick stopover, before travelling on to further destinations. In this case, our Madrid Airport Accommodation page is a useful resource, with information on nearby hotels and self-catering lodging, many with free shuttle services. 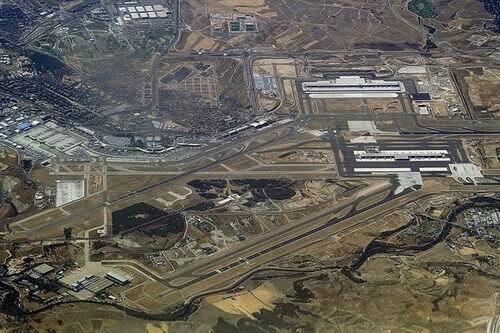 Barajas Airport Terminals 1,2,3 are all contained within one huge complex. Terminal 4 and Terminal 4S are in separate buildings. On approach by road to the first three terminals they are each colour-coded on the direction signs: orange for Terminal 1, green for Terminal 2, and red for Terminal 3. In fact, all of the airport signs on all of the major roads that access it are highly visible and easy to follow. The airport is easily accessed from Madrid's city centre. Terminals 1, 2, and 3 lie just eight miles to the northeast of the city centre and the city metro system will take you right there. Metro line number 8 from Nuevos Ministerios will whisk you over to all of Barajas Airport's terminals. Getting downtown from the airport is also very easy. We have more information about the different transport options available here. The metro stops at Terminal 2 on the lower floor, which has easy access to Terminals 1 and 3. It also stops close to Parking Lot P2. Terminal 1 of Barajas Airport has some beautiful colourful murals on display to admire. This terminal primarily handles international flights. Airlines operating from Argentina, China, Egypt, Mexico, Qatar, Saudi Arabia, Thailand, and the USA, as well as from many European countries for example, all come and go through Terminal 1. The check-in is to be found on the first floor. The boarding gates, zones A, B, or C, are also from the first floor as well as from the ground floor. Also on the ground floor you can find baggage claim areas 1 and 2. Terminal 2 of Barajas Airport operates with much fewer airlines, serving mainly European flights, such as to Germany, Portugal and Norway. You will find the check-in desks on the first and second floor of Terminal 2. The boarding gates, zones C and D, are to be found on the first floor. Baggage claim areas numbers 6 and 7 lie on the ground floor. There are left-luggage offices in both the T and T2 terminals. A passport or other ID is needed to use this service. Terminal 3 of Barajas Airport is the smallest of all the terminals. This terminal almost exclusively serves domestic internal flights around Spain. One of the air shuttles between Barcelona and Madrid operates from Terminal 3. There is another which leaves terminal 4. Check-in for the shuttle is on the first floor, while all other check-ins are on the ground floor. Also on the ground floor is the boarding gate for zone F with boarding gates for zone E on the first and second floors. The ground floor houses the baggage claim areas numbers 6 and 7. To connect between this group of terminals and the newer Terminal 4 building, walk outside Terminal 1 or Terminal 2 and head towards the shuttle buses. Just follow the signs to the terminal shuttle bus, which is free, and hop on. The buses leave every 5 minutes during the day and every 15-20 minutes during the night.